I've been wanting to put risotto on the blog since I first started it. It's one of those things (like making a roux) that has a mostly undeserved reputation for being difficult. Mom got an old copy of Marcella Hazan's cookbook and taught herself from there. Here's the first myth busted - you don't have to stir it constantly. You do need to hover a bit so it's not great for when you're busy with a million other things. The 2nd myth to discard - it doesn't take forever to make. I timed this one and from when I picked up the knife to cut the onion to serving it took 45 minutes. Again, not an every night thing, but even Rachel Ray can't be too unhappy with that. 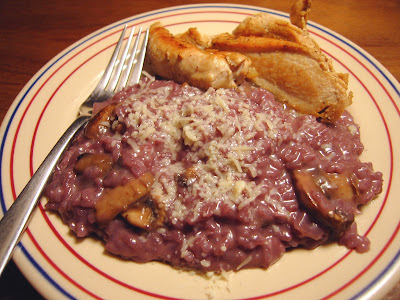 Make risotto just to prove to yourself that you can; make it because it's so creamy and satisfying; make it because you want something insano purple on your plate just for fun. Click here if you want more step-by-step instructions and photos. In a thick-bottomed saucepan, heat 2 T of the butter until bubbling. Add the onions and saute until they are starting to become translucent. Add the garlic and saute for about 5 minutes more. If things start to brown, turn down the heat a bit and move on to the next step. For the record, risotto doesn't traditionally have garlic, but I like it. Add the rice to the pot and saute until you see one or two grains start to brown. If you don't see that, just saute for 5 minutes and move on. This is a great time to twist in a little pepper, but not salt (it will make the rice tough). Add the wine and stir well. Adjust the heat so that the rice is bubbling well, but not furiously boiling. You should be able to walk away and just give it a stir every 2 or 3 minutes. Now you'll add the heated stock in 1 cup batches when the liquid has mostly cooked off, but the rice isn't sticking to the pan (every 5 minutes or so). I think this is the intimidating part, but you can't really mess it up unless you let it stick and burn. For the first couple of additions you should be able to see the bottom of the pot when it's time to add more. I've also seen recipes that just dump all the stock in and have you stir frequently (they claim to be just as good, but I've never tested this). While the risotto is going, saute the mushrooms in a hot pan with 1 T of butter until they are browned. Before adding the last cup of stock, give the risotto a taste. It should be creamy and thick and the rice should be cooked, but not mushy. You should be able to eat it with a fork. Sometimes I don't need the last cup, sometimes I need 1 cup more. To finish the risotto, add 1 T butter and about 1/2 cup grated Parmesan cheese. Stir vigorously and the risotto turns creamier and it's done. Now you can add the mushrooms and adjust the salt. P.S. This basic method works great for a simple (non-purple) risotto as well. Just omit the wine and use 2 cups more stock. You can also skip the mushrooms and add just about any cooked ingredient that suits the mood you're in - asparagus, roasted squash, shrimp, peas, corn and lime, herbs and lemon.